An alternative fuels company needed confirmation that a custom manual valve was in the correct position before starting a pump to offload a truck. They required a sanitary clamp end ball valve to allow for fast connection to the truck hosing. 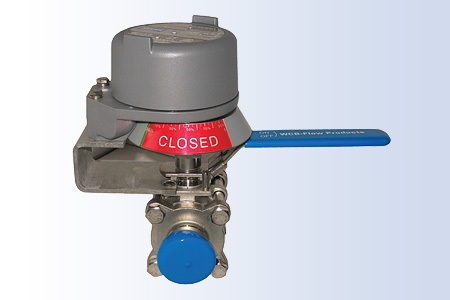 The Assured Automation 36CPF Series Stainless Steel Full Port Ball Valve offered the perfect solution. It is a full port ball valve, 316SS, triclamp end connections, with PFA seats and cavity filler. The ISO mounting pad on the valve allows for easy fabrication of a mounting bracket for the limit switch. The Assured Automation YE limit switch was selected, since it features an explosion proof enclosure Cl1, Div1&2. It features 2-SPDT mechanical switches, an easy screw off cover, touch set cams, and a visual OPEN/CLOSED indicator. The feedback switches confirmed valve position and provided the interlock to control the pump operation. This entry was posted in Custom Projects and tagged Ball Valves, Full Port Ball Valves, Limit Switches, Manual Valves, Stainless Steel Ball Valves, Stainless Steel Valves, YE Series Limit Switch. Bookmark the permalink.